Join us as we take on the Europes best kept secret, The Faroe Islands. During this week in April, we will guide you through the incredible Faroe Islands. Visiting places you would have hard to believe people would ever set foot. When joining Even and Roy to the Faroe Islands you can rest assured you will get to visit the highlights of what the islands have to offer. You will be in the hands of professionals guides and can expect to be well taken care of accordingly. During this week long tour, the Faroe Islands will be recovering from a long and dark winter. We might experience some snow in the highest peaks and maybe some night frost will occur, but most of the vegetation will be in a brownish yellow. Welcome to the first days of spring in the Faroe Islands. We will spend these days exploring the many epic locations the Faroes has to offer. You can expect us to be shooting from sunrise to sunset every day, given that the weather isn´t hazardous. 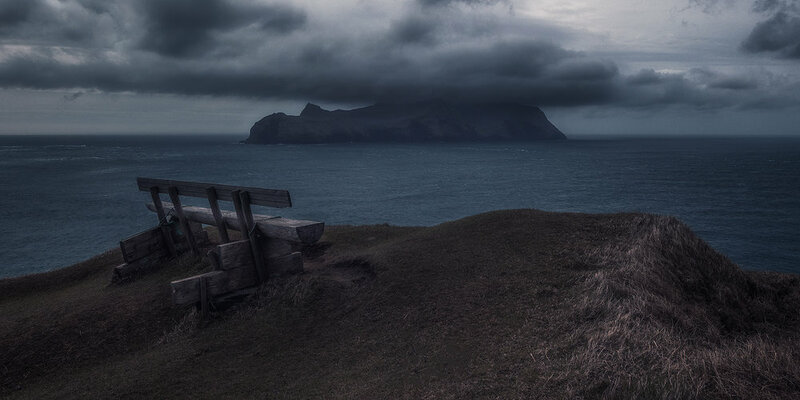 It´s no secret that the Faroe Islands is a weather beaten country, so be prepared for some nasty weather! We will pick you up at Vagar Airport and take you and the rest of the eager photographers to our hotel for a meet and greet. At this point you will get a run through of the program for the week as well as get to know us and the other participants. During this week you will be taken too amazing places in time for the good light and when you are not out shooting, Even and Roy will teach you how they use Adobe Lightroom to produce the images they envisioned from the day. This workshop is beginner friendly and will not be dipping into the world of Photoshop, but stick to Lightroom only. Transport from and to Vagar Airport (FAE), accommodation for the duration of the workshop, photography guiding both in the field and also post-processing sessions. We will dine together throughout the week. You will love the Faroese cuisine! Breakfast might be included at our hotel, but lunch and dinner are not. Also not included are any private insurances and any costs required to travel to and from Vagar Airport (FAE) from your home location. One of the main reasons people travel to the Faroe Islands are for the amazing nature and scenery. The fresh air, the deep blue ocean, the vertical sea cliffs and the pyramid-shaped mountains with their picturesque valleys, is something which would amaze anyone who enjoys being surrounded by nature. For generations the locals have lived off the land and the animals that are on the islands as not much grows in this climate. In total, the bundle of islands has a population of about 50000. "The forgotten Faroes are just a short flight from the UK, yet they’re way off the standard traveller’s radar. Adrift in the frothing swells of the north Atlantic, this mysterious 18-piece jigsaw puzzle of islands is at once ancient and very modern. Multicoloured cottages and grass-roofed wooden churches add focus to the grandly stark, treeless moorlands. Timeless networks of cairn-marked footpaths crisscross craggy layer-cake mountains. But even the tiniest once-inaccessible hamlets are now linked by a remarkable series of road-tunnels. And even as you bob around the dramatic fjords on a 70-year-old wooden sloop, your mobile phone is never likely to lose its signal." - You will need a sturdy tripod to be able to do long exposures. If you don´t own one, you can rent one from us. - Filters are optional, but recommended. - A laptop able to run Adobe Lightroom is highly recommended as you will be able to receive personal tutoring in that application. Make sure you have the latest versions before you arrive. - Extras like batteries, memory cards, and lens cloth are also highly recommended. - Believe it or not, but a shower cap will help you protect your camera from rain showers and sea spray, so we recommend bringing one or two - or something similar. 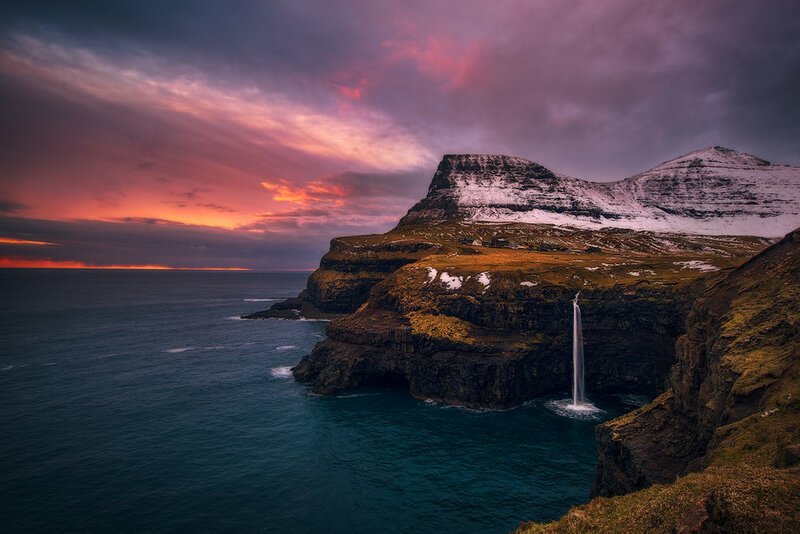 - The Faroe Islands will be at its first days of spring at this time and temperatures will most likely be cold, but not freezing. The weather can change very fast, so proper clothing is necessary. Being able to protect ourselves from the elements is key to a successful workshop. A good set of base layers, mid-layers for warmth such as fleece and down. A shell jacket and quick-dry hiking pants will help to protect against the elements as well. Good boots or insulated hiking boots are advised. Having a warm hat and gloves is essential. One thing is for sure, we will have wind and rain. So being able to stay warm and dry is important. We will explore many of the big and small islands of the Faroes. You can also expect to hike for a few kilometres, this is doable by most since it is not technical in any way. You can expect to catch a sunrise or two as well as sunsets. A tentative itinerary will be sent to you in good time before the workshop. The deposit is €800. All payments are done via our booking system (credit card and paypal payments) or invoice (bank transfer). Arrival: Vagar Airport, Faroe Islands (FAE). April 26st, no later than 2 pm. Departure: Vagar Airport, Faroe Islands (FAE). May 3rd, after 1pm.